Dan had just come back from a trip to the dentist via Citi Bike. He was full of ideas about how he will use bike share. 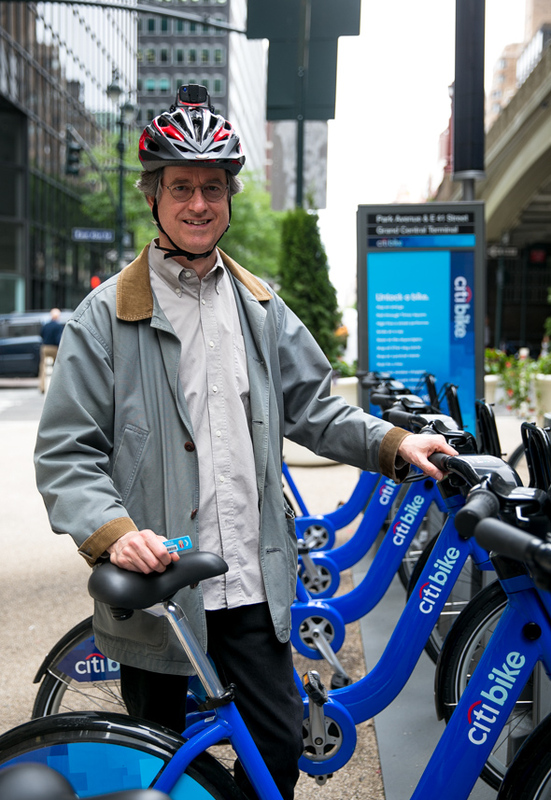 Rather than replacing the subway, Dan said Citi Bike may change which lines he takes. “I live in lower Manhattan but my studio (Dan is an artist) is in Sunset Park. Normally I take the F and transfer in Brooklyn. I’d rather take the D from Manhattan — it’s faster and more direct — but the station is a little far to walk. Now I think I’ll just hop on one of these. “Often, I want to use a bike for only one leg of a trip. If I’m going somewhere to pick up a large package, I don’t want the hassle of a bike for the return trip. And of course any crosstown trip is going to be much easier. This is such an excellent series. Can we compile them and send to the editorial board at the Observer? Those guys just don’t seem to get the concept. I agree! I live in Sunset Park and work in Brooklyn Heights – I find it annoying to transfer from the D to the 4/5 at Atlantic/Pacific. So now I take the D two stops to Atl/Pac and hop on a CitiBike for the last mile and a half to work instead of transferring. Exact same commute time, 100% more fun.